The Global Volcanism Program has no activity reports for Tres Vírgenes. The Global Volcanism Program has no Weekly Reports available for Tres Vírgenes. The Global Volcanism Program has no Bulletin Reports available for Tres Vírgenes. 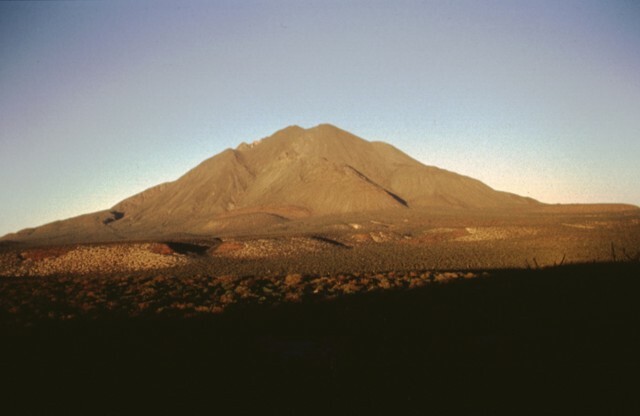 The Tres Vírgenes volcanic complex contains the only large stratovolcanoes in Baja California. The roughly 1940-m-high complex rises above the Gulf of California in the east-central part of the peninsula. 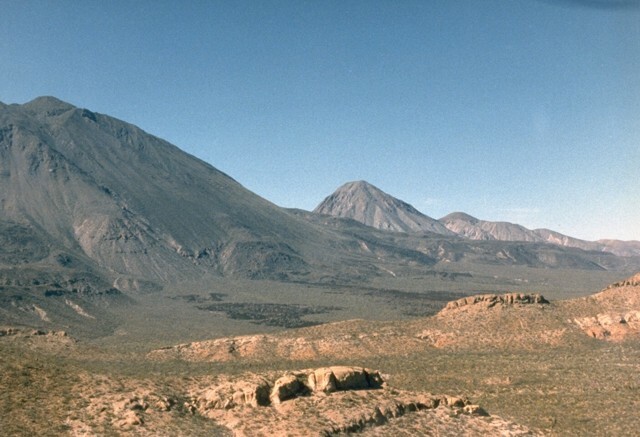 Three volcanoes, El Viejo, El Azufre, and La Vírgen were constructed along a NE-SW line and are progressively younger to the SW. The youngest volcano, La Vírgen, is an andesitic stratovolcano with numerous dacitic lava domes and lava flows on its flanks. A major plinian explosive eruption from a SW-flank vent was radiocarbon dated at about 6500 years ago, but Helium exposure and Uranium-series dates give a late-Pleistocene age for this event. An ash plume was reported from Tres Vírgenes volcano by a Spanish Jesuit priest while navigating the Gulf of California in 1746. No tephra deposits from such a young eruption have been found, but young undated andesitic lava flows at the summit could potentially be related to this event. A geothermal plant is located at the northern end of the complex near the margin of the Pleistocene El Aguajito caldera. This volcano is located within the El Vizcaino, a UNESCO Biosphere Reserve property. Capra L, Macias J L, Espindola J M, Siebe C, 1998. 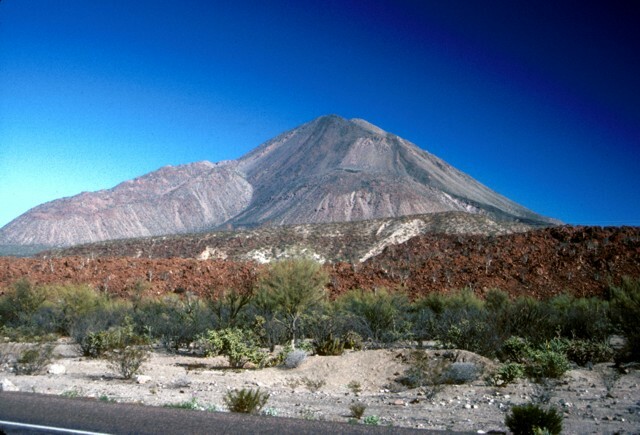 Holocene plinian eruption of La Virgen volcano, Baja California, Mexico. J. Volcanol. Geotherm. Res., 80: 239-266. Schmitt A K, Stockli D F, Hausback B P, 2006. Eruption and magma crystallization ages of Las Tres Virgenes (Baja California) constrained by combined 230Th/238U and (U-Th)/He dating of zircon. J. Volcanol. Geotherm. Res., 158: 281-295. There is no Deformation History data available for Tres Vírgenes. There is no Emissions History data available for Tres Vírgenes. Sharp-topped 1650-m-high El Azufre volcano (center) is the central peak of the Tres Vírgenes volcanic complex. Its summit lies about 4 km north of the highest peak of the complex, La Vírgen (left). The small peak on the horizon immediately to the right of El Azufre is 1370-m-high El Viejo, the oldest peak of the southward-younging Tres Vírgenes complex. El Viejo was constructed SW of the Pleistocene El Aguajito caldera, barely visible on the far right horizon. Both El Viejo and El Azufre are composed of dacitic lava domes and flows. Photo by Marjorie Summers, 1987 (Smithsonian Institution). 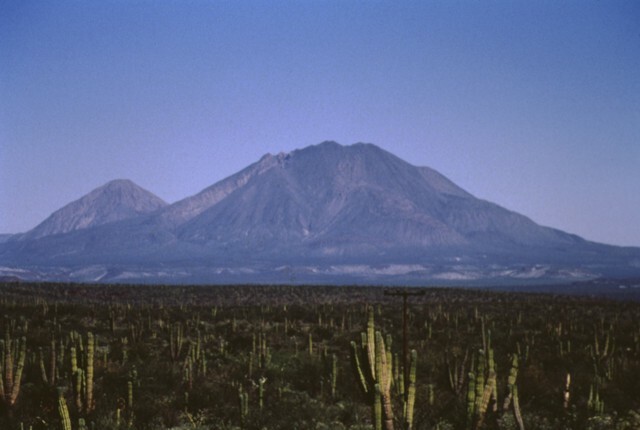 The two most prominent peaks of the Tres Vírgenes volcanic complex in central Baja California are seen here from the SSW. The steep-sided peak at the left is 1660-m-high El Azufre, a dacitic lava dome complex. La Vírgen (right), the youngest and highest peak, has a more complex history. This roughly 1940-m-high volcano consists of andesitic lava domes and andesitic flank scoria cones. It has erupted from both summit and flank vents and has produced both plinian explosive eruptions and dacitic and andesitic lava flows. A major plinian eruption about 6500 radiocarbon years ago from a vent on the SW flank at about 1400 m elevation produced a widespread pumice-rich fallout deposit and minor pyroclastic surges. The vent is located at the notch on the middle left skyline and was also the source of the 100-m-thick rhyodacitic lava flow that forms the lower left part of the cone. 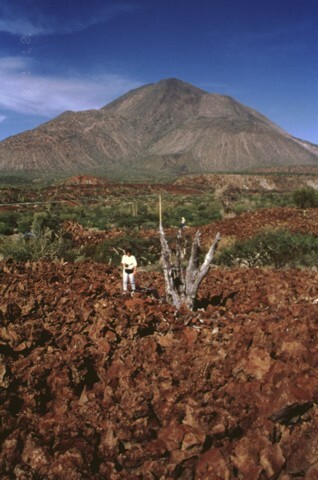 A volcanologist from the National University of México stands in the foreground on a blocky basaltic-andesite lava flow that may have been emplaced late in this eruptive sequence. 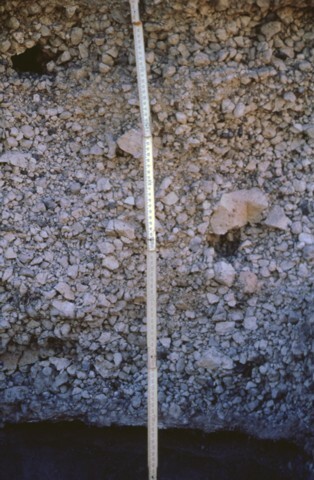 The middle unit of the La Vírgen plinian fall deposit displays a massive structure with large pink-colored pumice fragments. This deposit is the product of a plinian explosive eruption that occurred about 6500 radiocarbon years ago during the last major eruption of Tres Vírgenes volcano. The dispersal axis of this more than 1 cu km airfall deposit was to the SW. The eruption also included the emplacement of pyroclastic flows and voluminous lava flows. A panoramic view from the SE shows the Tres Vírgenes volcanic group, which is aligned in a SW-NE direction. Volcanism has migrated to the SW from the oldest peak El Viejo (extreme right) through El Azufre to La Vírgen (center), the highest peak. Prominent ridges exposed on the left flank of La Vírgen are rhyodacitic lava flows from the youngest major eruption. The smooth hills in the left foreground are Quaternary ignimbrite sheets probably related to La Reforma, a Pleistocene caldera east of Tres Vírgenes. The setting sun colors the SSW flank of Tres Vírgenes, the highest volcano in Baja California. Much of the volcano consists of lava domes and viscous lava flows. The protruding hills on the volcano's flanks are the rhyodacitic lava flows associated with the last plinian eruption of the volcano about 6500 years ago. The aligned flat terraces on the plain are underlain by basaltic-andesitic lava flows of Tertiary age. A producing geothermal plant at Tres Vírgenes supplies electricity to the Santa Rosalia grid. The Tres Vírgenes volcanic complex consists of three stratovolcanoes constructed along a NE-SW line. La Vírgen (the youngest and highest peak) is seen here at the left from the SE, with El Azufre forming the sharp peak at the right and the still older El Viejo forming the low peak at the extreme right. The sparsely vegetated dark lava flow in the center foreground is one of the youngest from La Virgen volcano. A major plinian explosive eruption from a SW-flank vent took place about 6500 years ago and was followed by effusion of a thick lava flow. 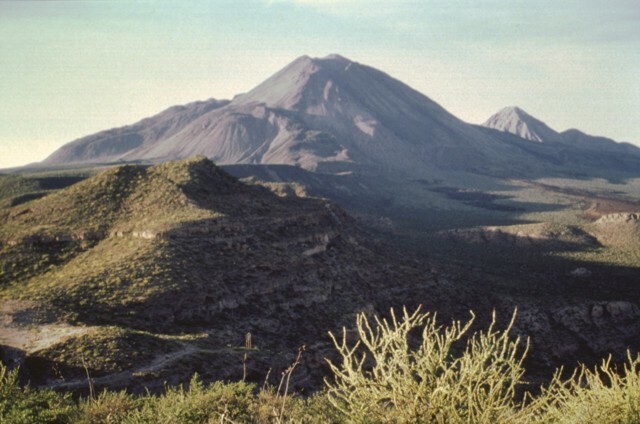 The Tres Vírgenes volcanic complex in central Baja California consists of a NE-SW-trending chain of three volcanoes. Volcanism has migrated over time to the SW. 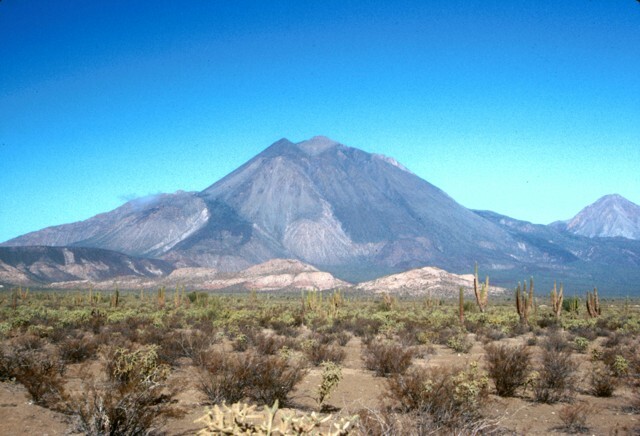 This view from the SE shows the intermediate-age volcano, El Azufre, on the right and the highest and youngest volcano, La Vírgen, on the left. The latest major eruption, about 6500 years ago, produced a plinian pumice-fall deposit and thick, viscous lava flows from a SW-flank vent near the notch seen halfway up the volcano's left flank. Photo by Brian Hausback, 1990 (California State University, Sacramento). Las Tres Vírgenes volcano is viewed from the SSE along Highway 1. The steep-sided viscous Southwest Coulee (La Vírgen) lava flow is prominent on the left horizon. Lava flows from Mesquital dome (reddish-brown color) are visible in the foreground. This lava dome lies on the lower southern flank of the volcanic complex near the highway. 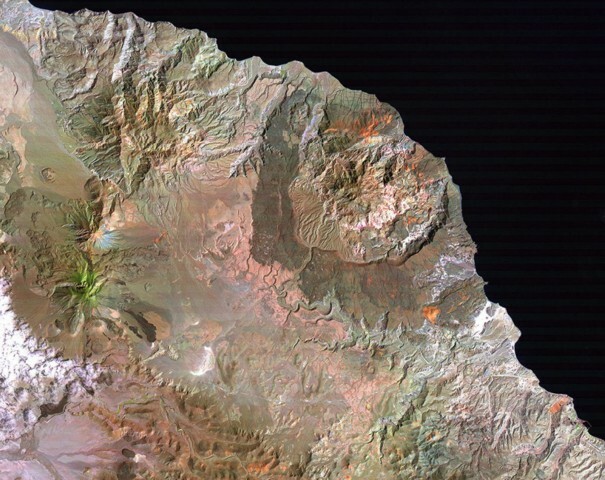 Three major Quaternary volcanic complexes are visible in this Landsat satellite image of Baja California. The N-S-trending Las Vírgenes volcanic complex at the left center consists of three southward-younging stratovolcanoes. The dramatic 10-km-wide La Reforma caldera along the Gulf of California coast at the upper right displays dark-colored andesitic outer flanks and a resurgent dome in the center of the caldera. 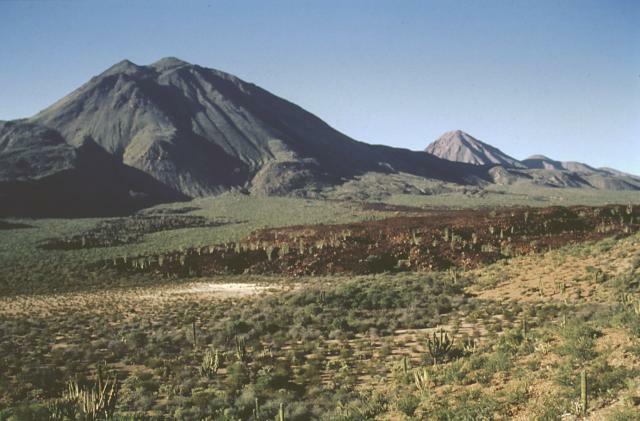 The extensively eroded El Aguajito caldera lies north of Tres Vírgenes and NW of La Reforma and has indistinct margins. Landsat image (National Aeronautical and Space Administration, processed by Brian Hausback, UC Sacramento). There are no samples for Tres Vírgenes in the Smithsonian's NMNH Department of Mineral Sciences Rock and Ore collection. Large Eruptions of Tres Vírgenes Information about large Quaternary eruptions (VEI >= 4) is cataloged in the Large Magnitude Explosive Volcanic Eruptions (LaMEVE) database of the Volcano Global Risk Identification and Analysis Project (VOGRIPA).